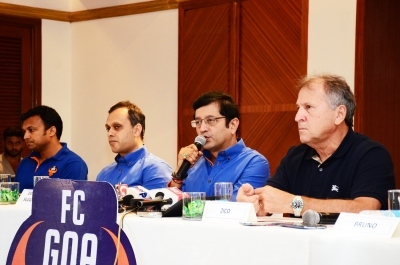 FC Goa owners say they had to resort to the actions like boycott and police complaint due to inaction of the Indian Super League organisers against the repetitive unsporting incidents in the whole League. Though they claimed having ‘good relation’ with the ISL organisers, both Dattaraj Salgaoncar and Srinivas Dempo said they were not happy with the way bad refereeing and aggressive football was handled by the ISL officials. “You can’t take Goans for granted simply because we are hospitable, adjusting and compromising. We had to show what Goa is when it comes to our pride and self-esteem”, said Salgaoncar, who has filed FIR for the first time in his life. Elano Blumer, the captain of Chennaiyin FC, was late last night arrested and released by the court early morning based on a complaint of abuse and assault filed by Salgaoncar. “For no reason, he came to our dugout and caught hold of my neck and elbowed me on my chest when I went to greet him for their 3-2 victory against us”, said Salgaoncar. According to Dempo, they would have pardoned Elano if he had apologised for his abusive behaviour or the ISL authorities had shown him red card. “We decided to boycott the prize distribution ceremony since the ISL officials did nothing in spite of repeated pleading’, said Dempo. Though ISL officials have claimed that they have not received any formal complaint from FC Goa, the co-owner said they have already filed a formal complaint and would wait for their decision. While the co-owners of FC Goa also complained about bad refereeing by Japanese referee Yudai Yamamoto, coach Zico also joined them stating that he had not witnessed such a referee in his whole career of football. The Brazilian coach also expressed surprise over some of the Chennaiyin trainers publicly displaying friendliness in a physical manner by putting arms on the referee’s shoulder, which is strictly banned in good football. “There are also good referees from China and Europe but this referee was bad throughout”, said Dempo. Salgaoncar said the ISL bouncers had even manhandled Dempo while entering the ground though anybody from Chennaiyin FC was let in. “There was total chaos at the entrance of the ground, thus I gave them benefit of doubt and did not make it an issue”, said Dempo, when asked why he did not file a complaint. Both of them, the football rivals otherwise in the Indian League, said they have never behaved in such a manner in spite of being involved in football for so many decades. People cool down, these mine owners are taking you guys for a joy ride with this Farca Goa blah blah blah. Don't forget that for years these Salgaonkars, Dempos and other mineowners have been looting Goa and Goan environment prey badly. Niz goekars should stay away from these people. having seen the match in uk on live telecast i came to conclusion that zico has done the best for the teams upliftment. three cheers to the team owners of fc goa. football is a sport and not a tug of war.i stand for fair play. win or loose.dosent matter if goa is banned. but let football as a sport remain undefiled. this was very sensitive issue for all goa..! this type of act is not acceptable .....at all ...! salgaonkars n dempos r pride of goa as dey promoted goans to top level ...! i think goa government should have taken some action against....! What Dattaraj and Srinivas has done is right. Elano not only attacked Salgaocar but he attacked GOANS. It's was a right decision by our FC Goa co owners and players to boycott the post match presentation as the refree'as decisions were not justified and it was not only during this game but the same thing was witnessed during the second leg of chennai vs Kolkata by the same refree.there was private security deployed at the stadium who did not co operate with our Goa police .It was really an insult to our politicians and other officers when these security personnel stopped their vehicles and didn't allow them to enter the stadium but the Ambani's were allowed royally to enter without a check.it was just a display of wealth possessed by the organisers nothing else.and this is not the 1st time elano has got physical with someone ,there were many incidents when he has done that. Dempo or salgaokar are not the first owner to have a team in indian football, they are running club like Dempo SC & salgaokar SC for a decade. And they have never complained about any problems to IFFA where there is more rivalry clubs like, MB,KEFC,etc, goans clubs were the rivals of every indian club in indian football history. There were fight long back between air India & salgaokar SC that show how much we goans love football, we don't like fake football, goans and Kolkata people believe football is our first sport and our religion. Do take us for granted. We are not fake football lovers, this isl is just a drama. there r losts of i league history in Kolkata as well as goa.I agree with my goan owners who did absolutely right. Dattaraj, these are small issues on the football ground. You have to be a fighter and player not just a organizer. Showed your weakness by going to the police. Let not them take advantage of our cool hospitality.. Isl management should have swung in action.. This is first time an owner of a club is abused and manhandled by a player in football world.